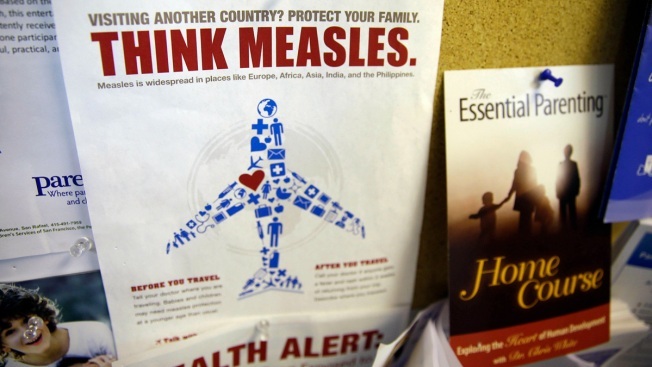 In this Feb. 6, 2015, file photo, a flyer educating parents about measles is displayed on a bulletin board at a pediatrics clinic in Greenbrae, Calif. Health officials say the number of confirmed cases of measles in western Washington has grown to 30, with nine more cases suspected. 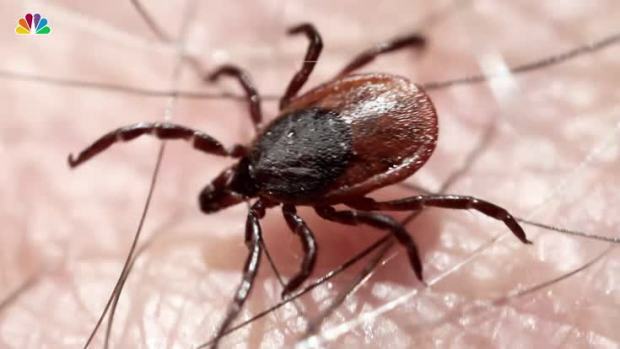 Clark County Public Health said Friday, Jan. 25, 2019, that 29 of the cases are in southwest Washington and one confirmed case is in King County, which is home to Seattle. The number of confirmed measles cases near Portland grew to 31 on Friday — an outbreak boosted by lower-than-normal vaccination rates in what has been called an anti-vaccination U.S. "hot spot." Public health officials in southwest Washington, just across the Columbia River from Portland, Oregon, said people may have been exposed to the dangerous disease at more than three dozen locations, including Portland International Airport, a Portland Trail Blazers game, an Amazon Locker location and stores such as Costco and Ikea. Parents continue to opt their school-aged children out of vaccination schedules as fears over vaccinations linger in the public sphere. Experts at Texas Children's Hospital say fears over vaccines causing autism - a theory disproven by the scientific community - may spark a comeback in illnesses like measles and other deadly infectious diseases in children. Most of the cases involved children younger than 10, the Clark County Public Health Department said in a statement. One adult is infected, and the rest are teenagers. Oregon officials didn't provide the age of the adult infected there. Inslee said the number of cases "creates an extreme public health risk that may quickly spread to other counties." "It's one of the most contagious viruses we have. It can have really serious complications ... and it's entirely preventable with an incredibly cheap and safe vaccine," Melnick said. "It's all hands on deck. Clearly this is going to cost hundreds of thousands of dollars, and it wouldn't surprise me if we were in the seven figures by the time we're done here," he said. "These costs could have been prevented if we had everybody vaccinated." Clark County, which includes the Portland bedroom community of Vancouver, Washington, has a measles vaccination rate of 78 percent, well below the 92 to 94 percent rate required for so-called "herd immunity," said Marissa Armstrong, the department's spokeswoman. Herd immunity happens when unvaccinated individuals are protected from infection because almost everyone around them has been vaccinated and is immune to a disease. Data on Portland's vaccination rate for both shots wasn't immediately available. Every time an unvaccinated person who has been exposed to measles goes out in public, "it starts that clock over again," Armstrong said.